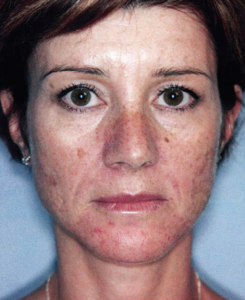 elōs Plus, known as an IPL (Intense Pulsed Light) treatment or a Photofacial, combines light energy and biopolar radiofrequency, to effectively resurface skin using lower levels of energy. It’s a great way to tighten and smooth your face or body, for younger-looking skin. You can use elōs Plus to treat wrinkles, stretch marks, acne scars, beard bumps, spider veins, pigment lesions (caused by broken capillaries or rosacea), or other discoloration. It can tighten pores and even re-firm certain areas, such as your stomach or under your chin. It may also treat acne, through destroying bacteria and slowing oil production. elōs Plus improves texture by inducing slight skin damage, which stimulates your skin to create new collagen—a natural protein that provides firmness and structure to skin. Collagen declines as we age or are exposed to UV light and toxins, like nicotine. This is why our skin eventually loosens and wrinkles. 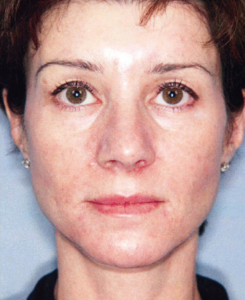 When your body repairs the laser-induced damage, it builds new, even and taut skin. Our Intense Pulsed Light services are available at The Institute of Plastic Surgery in Altamonte Springs or at our New Smyrna Beach location. If you have a tan, let it fade a few weeks before scheduling a treatment. And if you have naturally dark skin, schedule a consultation prior to treatment, to assess your risk of hyperpigmentation. Because elōs Plus uses lower levels of energy, it’s less invasive than CO2RE, but permanent discoloration is still a risk. Pregnancy hormones combined with laser therapy may also lead to hyperpigmentation. elōs Plus or Intense Pulsed Light is not for tattooed skin or patients who have taken Accutane or another isotretinoin in the past six months. If you have a history of cold sores or herpes, let your doctor know, because this may influence your healing process. It’s a good idea to stop applying harsh exfoliants or acne treatments two days prior to treatment. You’ll feel a warm, prickly sensation, like a rubber band snap, as the energy enters your skin. If necessary, we can provide you with a topical anesthetic. Treatment takes 20 minutes to an hour, and involves running a laser “wand” over the targeted area. For about a day following treatment, you may feel and look sunburned. Your skin may have a temporary redness or uneven tone, which will resolve within two weeks. You can apply makeup, using skincare products, and return to your normal activities immediately. But make sure to use sunscreen and protect the treated area from UV rays. Treatments should be scheduled every two to four weeks. You will likely need between two and six treatments. It will take a week or two to see full results, but then you’ll notice rejuvenated, more vibrant, and smoother skin. The effects of treatment may last up to a year.